Blog: A wee dram of Harris Tweed anyone? Anyone kicking off the New Year by taking a break from alcohol in January may be relieved - or revolted - to hear of a new development from textile technology experts at Heriot-Watt University in Scotland. They've developed a new Harris Tweed fabric that will permanently give off the smell of whisky. 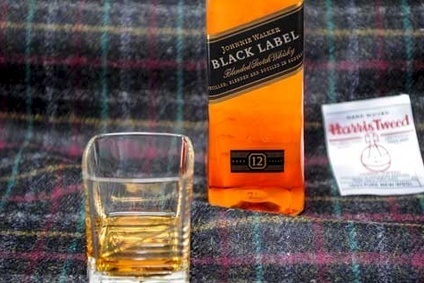 The smart fabric has been developed for Diageo's Johnnie Walker Black Label and features microencapsulation technology. The fabric is designed to reflect the colours of the whisky ingredients, and carries a unique scent - named Aqua Alba - designed to replicate aromas released from a glass of whisky such as peat-smoke, heather, wind-blasted wood and soft moss. Heriot-Watt's textile experts have helped to develop a process that allowed the scent to be layered into the fabric throughout the finishing process, so that it is permanently imbued in the tweed. The year-long collaboration with Harris Tweed Hebrides (HTH) is designed to help Scottish textile companies develop their business, add value to their textiles and bring exciting new products to market.